Free Carpet Buying Information for Homeowners! 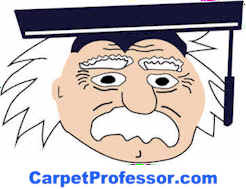 Welcome to CarpetProfessor.com! I retired after 30-years in the carpet business and no longer Sell or Install carpet or flooring. Want to learn all the secrets I know about making wise and informed Carpet choices? Want to save time and money? This is a free service. My goal is to help homeowners save money and make wise and informed carpet buying choices. Everything you need to know about buying new carpet is posted on my website and is provided absolutely free with no strings attached whatsoever. I encourage you to take full advantage of all my free carpet information and unbiased advice to help you choose wisely and help you save hundreds, if not thousands on your next new carpet purchase! Don't be Victim of a RETAIL CARPET SCAM! I've been helping homeowners avoid common carpet scams and save money on new carpet and flooring for over 18 years! It's easy to make costly mistakes when choosing new carpet. Be very careful who's opinion and advice you trust! Most carpet websites do not provide complete, accurate or honest carpet buying information and advice! Buy the wrong grade of carpet and you stand to lose hundreds or even thousands! I am here to help you make sense of it all. Take your time and read through all my free articles, take my powerful Carpet Foot Traffic Test, print out my free checklists and take my challenging Carpet Quiz. Take time to fully analyze all my pricing charts and print out my free discount coupon for up to $100 off new carpet and my useful carpet shopping forms. Take a look at my free Carpet Buying Checklist. After one or two visits to a carpet retailer, most homeowners will quickly discover that selecting new carpet is very difficult, time consuming and confusing. My website was created to help educate homeowners sort through all the carpet buying nonsense. I think all homeowners deserve to have simple and honest carpet buying choices but for the past 30 years that's not been the case. Most of the "free" carpet information I find posted on the internet is either limited, wrong or misleading. It's hard to find honest and candid advice that will truly help you choose wisely and avoid common carpet scams. Don't make the mistake of believing all those online reviews about businesses or contractors. Most of the reviews are not worth considering. Why? There are many reasons why, but first of all, most homeowners have limited experience dealing with businesses and contractors and may not know how to tell if a contractor did a fair job or did a really great job. The best online reviews are posted by homeowners who have had many dealings with various types of businesses and contractors over many many years. You have no way of knowing if the review you are reading was written by someone who has dealt with just one contractor or by someone with decades of experience dealing with dozens of businesses and contractors. I don't make any decisions based on online reviews. Some of the best businesses and contractors have negative reviews posted on the internet. You should not put too much weight based on online reviews because they not be accurate or may be skewed or falsified just to make the business look bad. It is common for some sly business owners or salespeople post negative reviews just to hurt nearby competing businesses. They try to make the review sound real and honest but in reality it is a fake review with no merit. The business who is the victim of these fake reviews have no way to remove or combat this type of assault and often suffer significant loss of business revenue as a result. For this reason, I suggest you don't believe everything you read. I rely on Corporate Business Records, Better Business Bureau reports and a nice website that offers clear and transparent ownership, staff and business practices can help give you peace of mind when choosing a carpet or flooring dealer to buy from. There are literally dozens of ways for you to make simple but costly mistakes and end up unhappy with the end result. Making wise carpet choices requires that you do your carpet homework before you begin shopping for carpet. I can't tell you what carpet to buy, but I can give you unbiased advice to help you make wise and informed choices. Take a look at my sitemap to see if I have already answered your question in one of my free articles. Watch Out For Greedy Carpet Retailers! Many carpet retailers hire pushy salespeople who will say or do just about anything to close the sale! Some of these sales professional know very little about carpet. They are hired because they are good at closing the sale. That means they don't take NO for an answer. They will keep grinding on you to wear you down until you finally say YES, agree to buy and write them a check. In reality, you likely agreed to buy only because you thought it was the only way to get them to LEAVE your home! If this has recently happened to you, you should know that you usually have a three-day right of rescission to cancel your order. You have to act fast and follow some rules set forth by the FTC. Buying Locally is Important for So Many Reasons! You need to make sure you only buy from a reputable, locally owned carpet dealer with honest and knowledgeable salespeople who will take their time to help you choose new carpet and flooring wisely, to measure your home accurately and to give you a fair and square deal. You should NEVER feel pressured into buying any flooring products until you are fully satisfied with your selection and are sure that you are buying from a reputable dealer. For this reason and many more is why I decided to create my website and to expose the truth about the carpet business and to educate and inform homeowners how to choose new carpet wisely and to show homeowners how to avoid common carpet scams! Nylon is the most durable synthetic fiber available today. Beware of Carpet Retailers or Salespeople who recommend you buy carpet made from Polyester or P.E.T. Polyester and say it is "just as durable" as a carpet made from Nylon. Carpets made from Polyester tend to mat down very quickly in medium to heavy traffic applications, especially in main walkways, hallways and on stairs. 1. Everything you need to know about choosing and buying Carpet, Padding and Installation can be found on this website. 2. Visit my Carpet Q & A pages to read my answers to common carpet buying questions. 3. You can print out all my pages, analyze useful charts, print free shopping forms and shopping forms and even print out my Special Discount Coupon that could save you up to $100 on new carpet. Because they buy the wrong grade of carpet for their needs! Because they don't compare several bids or estimates! Because they don't buy from a reputable flooring dealer! Because they don't maintain their new carpet properly! It's your responsibility to choose new carpet wisely. You should never rely solely on any one salesperson to make your carpet and padding choices for you. If your new carpet does not perform as expected, you cannot go back and blame the salesperson for giving you bad or wrong advice. Only buy from a reputable carpet dealer! Many carpet salespeople lack sufficient "hands-on" carpet experience and don't have enough product knowledge to know what grade of carpet is able to meet YOUR needs, goals and lifestyle. Unfortunately there are also plenty of unscrupulous carpet salespeople who are hoping to overcharge you by using sneaky sales tactics, deceptive advertising gimmicks, bait & switch tricks and literally dozens of other common retail carpet scams! Most homeowners are overcharged for Carpet, Padding and Labor! If you get three carpet estimates from three different carpet dealers, I guarantee you will get three different estimates for the amount of material your home requires. Some salespeople over-measure intentionally while other salespeople over-measure because they are not well trained at the art of carpet measuring. They would rather order too much material than to not have enough material to complete the job. This means you are paying for material and labor costs that are far above what is necessary. This can easily cost you hundreds or thousands more that is necessary. Why? Because measuring for carpet can be difficult and every carpet salesperson has their own unique methods for measuring. The hard part is determining which bid/estimate is the best price or which measurement is the most accurate! This is why you need to get several estimates. You need to compare several bids side by side. Then you can start asking key questions like why is one estimate higher or lower than the other. Not sure if your free estimate/measurement is correct? Learn How to Measure for Carpet Yourself! Unscrupulous carpet salespeople may also intentionally over-measure your home just to increase their profits. A sly salesperson can easily cheat you out of your hard earned money using any number of different carpet measuring scams. Best places to shop for new carpet? Salespeople lacking measuring experience can cost you. It can take years to learn how to properly measure for carpet. Salespeople who are new to the carpet business may not be very good at measuring. Their biggest fear is not ordering enough material to finish the job, so to prevent this, they might add an extra 10, 20, 30 or more yards of carpet "just to make sure" they have enough material to complete the job. This can easily cost you hundreds! For example, Let's say you are spending $30 per yard for carpet, pad and installation... Ordering just 10 extra yards more than you require will cost you $300 plus tax. Ouch! There are smart ways to make sure you are not a victim of a measuring scam. To be successful at buying new carpet for your home, you just need to select the right grade of carpet for your needs, choose the correct padding, have your home accurately measured and have it all installed by a qualified carpet installer... All for a fair and reasonable price! Carpet is more expensive then most homeowners realize. When you finally add up all the costs for materials and labor it can easily give you a severe case of sticker shock. Don't settle for an inferior quality carpet. It's not a good idea to select new carpet based on how much money you have to spend on the project right now, as it almost always ends in frustration. If you find that you can't afford the carpet of your dreams, either wait till you have more money, or do your carpet project in two or more stages, but never sacrifice quality and settle for a lower grade of carpet! Choosing the Right Grade of Carpet is not as easy as most folks think. It's not like it was 30 or 40 years ago when choices were very limited and most carpets were manufactured quite well. Today there are thousands of different grades, styles and quality levels to choose from. This makes it very difficult for most homeowners to make wise choices. Choose the wrong grade of carpet and padding and your carpet may wear out way faster than you expect. Some Carpets are only designed to last for just a couple years before they start to wear out... but some carpets are made so well, they can easily last 20 years or more! What is the difference you ask? Why do some Carpets last longer than others? It all depends on the materials they use to manufacture the carpet! Most important is choosing the best carpet fiber for your needs! The problem with selecting the right carpet is... You can't tell the difference just by looking at the Carpet samples or just by feeling the carpet pile with your hand. All carpets look fabulous when they are new! Everyone wants to buy a carpet that is soft and luxurious, but just because a carpet feels soft does not mean it's durable or able to tolerate YOUR level of foot traffic. Don't buy a carpet just because you love the color or it feels nice and soft! If you want a carpet that will last a long time, you need to select a carpet made from the most durable materials! Here are 5 "Key Carpet Specifications" you need to know and understand. Fiber Type - Nylon, Polyester, Olefin, Sorona, P.E.T, and Wool are most common. Tuft Twist - Strands of Fiber are grouped together and twisted while heated to form a tuft. The number of twists per "lineal inch" is the Tuft Twist Rating. Face-Weight - The weight of the surface fiber, also called the "Pile". Does not include the weight of the backing. Pile Density - A number ranging from 1000 to 6000 to define how dense the carpet pile is; a mathematical formula based on the pile height and face-weight. It's also very important to choose the correct carpet padding for your home. Some pads offer excellent support for your carpet while others are not so great and are way over-priced. It is real easy to select the wrong type or quality of padding or be swayed by an inexperienced carpet salesperson to spend much more than is necessary for a "specialty" padding, or a padding that cannot meet your needs and goals.